The basolateral potassium conductance of cells of most epithelial cells plays an important role in the transcellular sodium transport inasmuch as the large negative equilibrium potential of potassium across this membrane contributes to the electrical driving force for Na+ across the apical membrane. In the present study, we have attempted to establish, theI-V curve of the basolateral membrane of theAmphiuma collecting tubule, a membrane shown to be K+ selective. TransepithelialI-V curves were obtained in short, isolated perfused collecting tubule segments. The “shunt” conductance was determined using amiloride to block the apical membrane Na+ conductance. In symmetrical solutions, the “shunt”I-V curve was linear (conductance: 2.2±0.3 mS·cm−2). Transcellular current was calculated by subtracting the “shunt” current from the transepithelial current in the absence of amiloride. 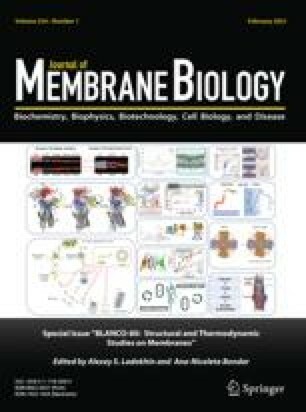 Using intracellular microelectrodes, it was then possible to measure the basolateral membrane potential simultaneously with the transcellular current. The basolateral conductance was found to be voltage dependent, being activated by hyperpolarization: conductance values at −30 and −80 mV were 3.6±1.0 and 6.6±1.0 mS·cm−2, respectively. BasolateralI-V curves were thus clearly different from that predicted by the “constant field” model. These results indicate that the K+-selective basolateral conductance of an amphibian collecting tubule shows inward (“anomalous”) rectification. Considering the electrogenic nature basolateral Na−K-pump, this may account for coupling between pump-generated potential and basolateral K+ conductance.